I decide to use part of the first one for a dinner salad that I have been thinking about since Monday night, when I had an amazing Beetroot, Pear and Goats Cheese salad starter. I loved the goats cheese, but decided to omit the cheese in mine (since I new the rest of the cheese would most likely just go to waste) and instead added half a breast of chicken. With my new purchase in hand I decided to swap the pear for pomegranate seeds, and I was not disappointed. Add the beetroot to a small roasting pan with a glug of olive oil and season with salt and pepper. Place the roasting pan in the oven for around 40 minutes (turning down the heat if they start to burn). While the beetroot is roasting prepare the pomegranate, this is by far the most time consuming part of the process. Using a knife to chop off the top and bottom off the pomegranate, then slice down one side, just through the skin. Use your hands to pull apart the pomegranate. 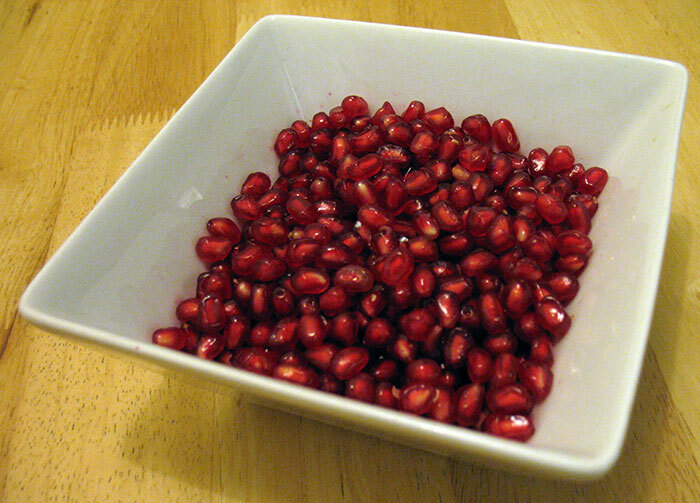 remove all the seeds from the pomegranate and place into a bowl, removing as much of the white membranes as you can. If adding the chicken breast split into two equal size pieces, I dusted mine with a tiny bit of cornflour. Place the chicken pieces on to a grill pan, turning occasionally, grill until cooked through. You can then add the washed rocket to each plate and drizzle with another glug of olive oil and the vinegar. Once the beetroot and chicken have finished cooking, leave them to cool slightly (for around 5 minutes) before adding them to the plate. Finally top with pomegranate seeds and serve. 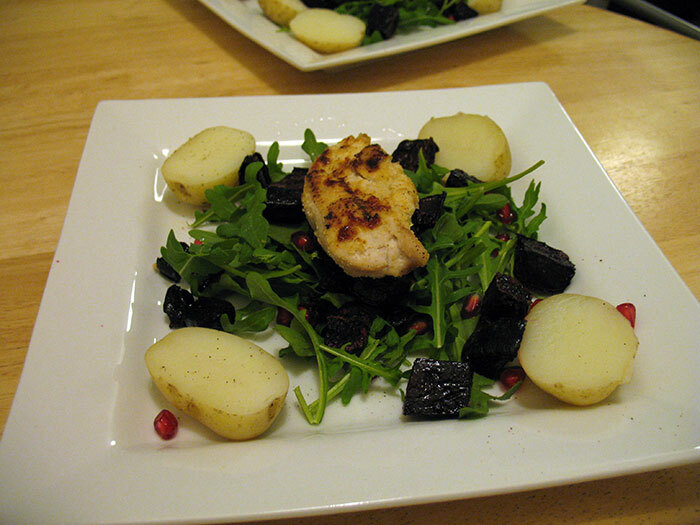 The result was sweet beetroot offset by the bitterness of the rocket leaves, it was a wonderfully light dinner – a great change from all the casseroles and stews! I also had the extra bonus of spending the rest of the night munching through the rest of the pomegranate seeds.